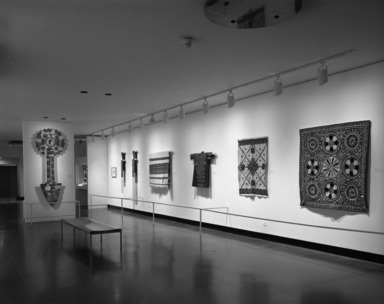 February 21, 1985 Islam in Africa, an exhibition of close to 50 Islamic works of art from the African continent drawn from the permanent collection of The Brooklyn Museum, is the focus of the Curator’s Choice exhibition opening at the Museum on February 21. 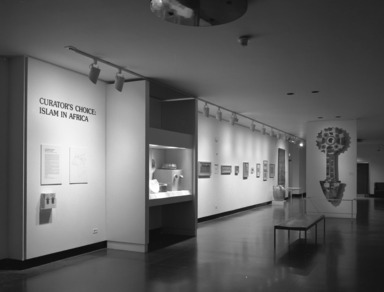 Curator’s Choice: Islam in Africa will be on view in the Lobby Gallery through May 20, 1985. Islam in Africa will investigate the influence of Islamic culture on three regions--Egypt, North Africa and the sub-Sahara. Despite the very different history of conversion to Islam in each region, similar patterns of cultural confrontation and adaptation apply to the arts of each area. 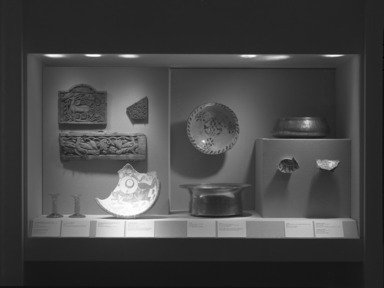 The objects in this exhibition demonstrate the adaptation of art styles, as well as ritual practices, which occurred between the Islamicized and native peoples. Brass vessels from present-day Ghana show the efforts of local craftsmen to decorate their wares by imitating Arabic script. A brass pouch from Liberia is a copy of a common style of leather pouch from the Maghreb, transformed into brass by a local artisan. The Muslim population also borrowed some of the practices of the local peoples to suit their own needs. 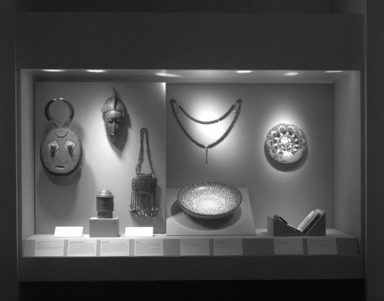 The masks in this exhibition which come from the border region of Ghana and Ivory Coast play a prominent role in the ritual activities of the Islamic communities. In some regions of northern Ivory Coast, the Dou face mask performs at the celebrations which mark the end of Ramadan and is also brought forward to greet visiting Muslim dignitaries. The Gbain face mask, commonly known as “bushcow” mask, is used by Muslims and non-Muslims in times of crisis when witchcraft is believed to threaten the well-being of the community. While masquerades are a common feature of life in the native communities, the use of masks by Muslims is unknown in other parts of the Islamic world. 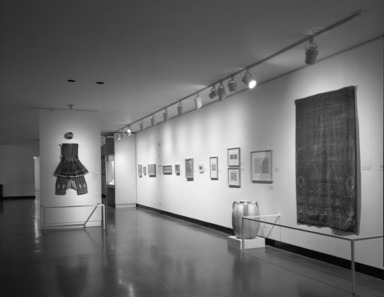 Gallery talks on the exhibition will be held on Sunday, March 3 and Saturday, March 9 at 3 p.m. in the Lobby Gallery. 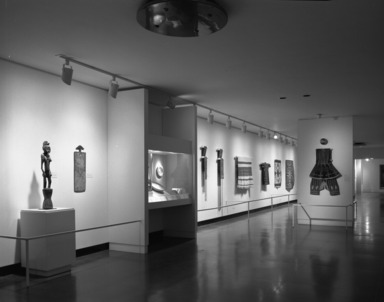 On March 3, Victoria Ebin, Associate Curator, Department of African, Oceanic and New World Cultures will speak on “Islam in West Africa.” On March 9, Sheila Canby, Associate Curator of Islamic Art will speak on “Islam in Egypt and North Africa.” Both programs are free with Museum admission. Brooklyn Museum Archives. 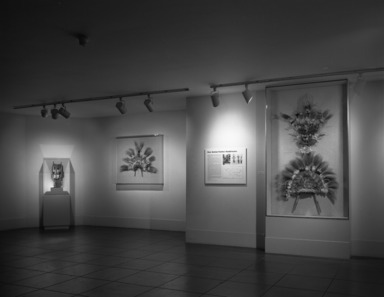 Records of the Department of Public Information. 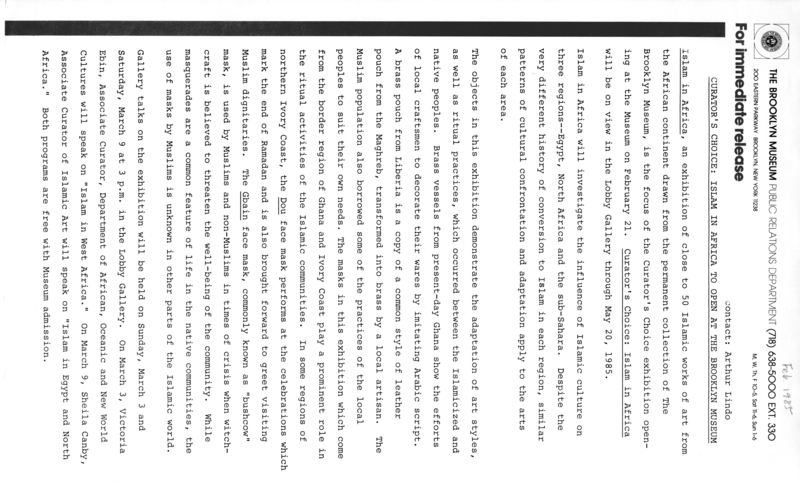 Press releases, 1971 - 1988. 1985, 010.